For 40 years, Hubbardton Forge has been creating masterpiece after masterpiece for your home. A combination of quality and design have awarded this company with their global reputation. Not many in this industry can display the workmanship and art that goes into each and every piece that is produced. Their hand-forged designs are created by tradesmen that love their work and take pride in every piece that they work on. When it comes to lighting, Hubbardton Forge knows design. When it comes to chandlers, turn to Hubbardton Forge Chandeliers. Chandeliers were originally created with large rooms in mind. Their grand designs and wide sweeping fixtures were created to be the centre of attention. While the uses have broadened, the large, single room chandlers still demand the full attention of any room they are placed in. These beautiful works of art are created to decorate and complete a large area. The Hubbardton Forge Ball Basket 36 Arm Chandelier is no exception. This magnificent fixture has 36 arms, each holding a candle style bulb. Its 72″ diameter makes this fixture one of the only fixtures you will need for both lighting and decor. As with all Hubbardton Forge Chandeliers, it is hand-forged, made specifically to your order, and it comes in a variety of finishes. It is when it comes to decorating smaller spaces that you can really see how far chandeliers have progressed. There are thousands of beautiful, smaller Hubbardton Forge chandeliers (http://blog.crescentharbor.com/hubbardton-forge-chandeliers-perfect-centerpiece-room/) available on today’s market. They both complement and enhance a smaller space or room. Whether it is to create bathroom lighting or to add a decorative element to a walk-in closet, there are countless options to choose from. 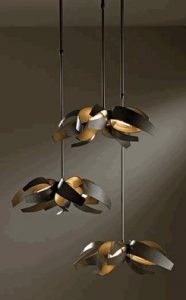 The Hubbardton Forge Triple Corona Pendant is one example of this. This triple fixture light hangs beautifully in smaller areas. Designed to be longer than it is wide, it creates beautiful lighting without taking up large amounts of space to do so. Its attractive sophistication adds a decorative element to any room without consuming the area around it. The triple fixture design makes it a truly unique fixture to any home it is placed in. Hubbardton Forge chandeliers really shine when you want something that is truly unique. The Cirque 8 Light Chandelier is one of these examples. This unique globe both lights and decorates in a way that no other fixture can match. The design is created to stand out and be a focal point while still matching and accenting its surroundings. It is light fixtures such as these that show individuality and uniqueness to the room—and to the decorator that chose it. It is easy to see why Hubbardton Forge Lighting is ahead of its industry. Designed and forged in Vermont, these Engineers and Designers know no bounds. Forging iron and steel, they strive to create fixtures that will amaze while still using the highest quality of materials available. Made specifically to your order, these fixtures represent one purchase you will not regret buying. At Crescent Harbor, we enjoy seeing the joy these fixtures bring to our customers. We love the quality and design of Hubbardton Forge chandeliers and are proud to be able to offer them to you. The post Hubbardton Forge Chandeliers are Chandeliers for the Future appeared first on Crescent Harbor. Do You Want To Know The Top 6 Sober Living Mistakes That Can Lead To A Relapse?